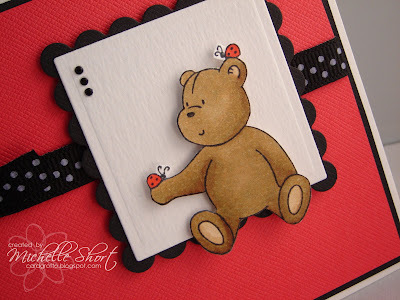 Here is my second sneak peek of the day using the lovely new soon to released Elzybells Ladybug Fun stamp. I wanted to show you that although there are 3 bears on the image you can use just part of the whole image too. I have stamped the image out, coloured with Copics and cut out. I have added him to a square made with Nesties and this has then been added to the base with 3d foam pads. 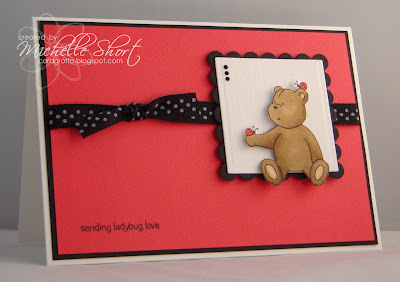 The base is red & black CS added to a white card blank with ribbon wrapped around. Sentiment from the Cute Critters set stamped at the bottom and teeny gem stones added to the image panel to finish. So, do you know which new stamps you want to get yet? I know I have a long list! STAMPS: Elzybells Art Stamps. INK: Memento Tuxedo Black. CS: Anita's, Doodlebug Designs. ACCESSORIES: Nestabilities dies, ribbon by Ribbon Oasis, Papermania Adhesive Stones, Copic markers. Another couple of adorable sneak peaks Michelle. You have proved how versatile this stamp is! The ladybugs with the bears are soooo cute! I can't wait for the new releases tomorrow now! what a beautiful card Michelle,l love the colours. Michelle this is so cute!! The colour combo is great. The placement of the bear is perfect in the square and beautifully coloured. OH, this is just darling! Love the teddy popped up of the square layer! i love how clean and simple this is!! so VERY cute!!! Awww, love this little ted! Gorgeous card, Michele.